I have a keen interest in nutrition for both dogs and humans and therefore have a strong belief in feeding your dog the best quality food that you can afford. Using food with natural, high-quality ingredients, makes a significant positive impact on your dog’s behaviour as well as clear benefits for its long-term health. In my daily work as a dog behaviourist, I am frequently looking at areas in the dog’s life with its family, whereby we are seeking to bring a sense of balance back into that relationship. I am not so concerned with the very highest levels of obedience and tricks, but a dog that is in harmony with itself and the environment it lives in. My passion lies in helping create a relationship that allows the dog to be well mannered, content and for the owners to see their dog behaving in a way that is natural and free from what they consider to be stressful behavioural patterns. I believe that providing your dog with a nutritious, natural and balanced diet is the very first step that can be taken to help ensure that a dog is able to learn, relax and enjoy its environment. The dog food industry is a multi-million-pound one and the choices available to us these days are overwhelming and at times confusing. Loosely speaking there are a few different ways to feed a dog: A dried kibble. A wet food in a tray. Raw feeding. Home cooked approach. To cook for your own dog at home, you will need some time and healthy recipes that help ensure you meet the guidelines for a balanced meal. Raw feeding has seen a big rise in popularity and there are a good number of established brands on the market. Wet food (more like a paté consistency) in a tray is what I feed my own dogs and I favour the Forthglade brand as it is free from anything unpleasant and the dogs absolutely love it. These foods are usually cooked in the tray at lower temperatures, thus preserving the nutritional content and not denaturing the food which we can see in kibble. Finally, kibble is a mixture that has been extruded through small holes, baked at high temperatures (not so good) and then sold in sacks. The starting ingredients remain important and there is a wide range of kibble for sell from the additive-laden brands (think Bakers and Pedigree), through to brands which do a much better job at keeping it additive free (think James Wellbeloved and Burns). Cold pressed kibble is becoming more common and this avoids the high temperatures that I refer to above. I have found time after time that whilst we the owners may have ideas of what our dogs should eat based on our budget and nutritional principles, the dog cannot always be persuaded to agree and so sometimes a compromise may need to be made. Become a label reader and do your research so that you are confident that you’re not fuelling your dog’s behaviour problems with a poor diet. Should you decide to change your dog’s diet, make those changes over a 7-10 day period so that you fade out the old and increase the new over that period. Here follows ten tips and advice on the effects of canine nutrition on behaviour. These form general guidelines and please remember that as with people, all dogs are different and may respond better to some methods of feeding or brands than others. During my dog behaviour career, I have been to many homes that have been feeding their dog a low-quality brand of kibble laden with artificial additives. The types of behaviour that these dogs were demonstrating ranged from hyperactive behaviour, a lack of focus on anything for long, higher levels of reactivity towards people, dogs or their environment. Removing them from a low-quality diet and placing those dogs on a food that was specifically free from any additives immediately improved the situation or the poor behaviour. These changes in diet helped support further work that was carried out to create a calmer, more focused dog. In contrast to my above point, I have also experienced cases where the dog is overweight, lethargic and as a result, had low energy levels and a poor desire to please. This is often accompanied by physical symptoms such as dry skin, scurfy coat, bad breath/teeth and loose stools. Many of these symptoms can be alleviated by ensuring that your dog is fed a high-quality food, which helps restore the dog’s natural balance both in terms of its behaviour, and the physical symptoms I describe above. It is always a real pleasure to see how a dog can change for the better as a result of an improved diet and to also see how the relationship can improve dog and owner. The location that you feed your dog in is really important. Whatever place you choose, it should be the same for each meal. Ideally, it would be a quiet place away from busy thoroughfares, which will allow your dog to feel relaxed as it eats and drinks. Taking care to ensure that young children cannot disturb the dog whilst it is eating is most important. Whilst the above points are relevant to the feeding location, a moderate amount of background noise and activity and the presence of the owner or other people is acceptable, as it helps your dog to adjust to the family life you lead. All families are different, but a routine is an important element of feeding your dog, as it allows him to become accustomed and confident that he will be fed at a set time and location. Keeping your dog’s mealtime within a reasonable timeframe for each meal will help manage his expectations and help reduce begging at other times. Ensure that your dog has at least an hour or more to digest his food before exercise or his sleep time. Avoid sharing your own food from your plate with your dog, as this will only encourage him to beg and become a nuisance. Healthy leftovers can be provided as training food in a more controlled manner. Ensuring that your dog expresses good manners in and around food and feeding times is really important. Highly desirable and good quality food acts as a clear motivational reward for most dogs and as an owner you should make sure that your dog will sit and wait at a respectable distance whilst you prepare the food. Once you are ready to feed your dog, you can ask for a brief sit and wait, to place the bowl on the floor, to waist a few seconds (I often advise owners to count to five in their heads) and to then release the dog with a clear ‘Okay’ command, so that the dog can enjoy its food in peace. Close the door. Probably my least favourite approach as I like to keep dogs involved, and to use obedience rather than just shutting them away. This simple approach means that you shut the dog out of the room when you eat. The obvious benefit is that you don’t need to manage the dog this way, but you may experience whining, barking or scratching as a result. Fixing point method. I have been using this method for many years with great success as it enables the owner to manage the dog in a set location and allows you to work towards the ideal method which I set out below for you. The simple premise is that you (depending on the size of your dog) create a solid fixed point near your dog’s bed that is likely to be in the same (or adjacent) room you’re eating in and that your dog cannot move from that point until you release it. The dog is meant to feel relaxed and comfortable using this method - it is not a punishment, so some practice prior to using it at meal times can be useful. Make the lead the same length as your dog from his collar to the base of his tail, so that he can move, stand up and lie down okay and attach that lead on the fixed point such as heavy furniture (a sofa leg next to the dog’s bed is often suitable) or for a bigger dog in a more open location away from furniture a wall mounted plate that you can attach a lead to. Often found in hardware stores or livery centres. 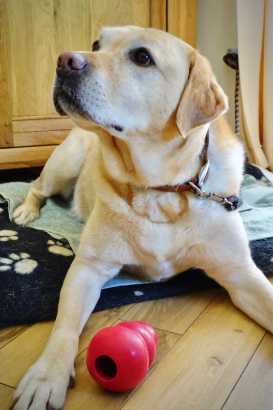 Providing a Kong or a suitable chew for your dog whilst you eat is actually fine in my book as it can help cause the distraction in the early days and weeks of using this method. Send to bed. This is essentially the same as the above fixing point method, but you are relying entirely upon obedience commands and will do away with the line to keep the dog in its bed. Watch your dog carefully as you eat and should he move off the bed, you’ll need to quickly but calmly return to put him back there and start again. As you build this duration up, it will be the method that we use in our household and the dogs will eventually accept it without question. Avoid interrupting your dog when eating by lifting its bowl as a test, as this can often cause a sense of protectiveness over the food. Your presence when your dog is eating should give the dog a relaxed feeling. This can be easily achieved by dropping in tasty morsels as the dog eats. Once you are happy that the dog is relaxed in your presence and it understands some basic obedience, you can request a sit and wait command mid-meal and add in something really valuable and then release the dog to eat again. This whole approach really works on the principle that your presence (or anyone else come to that) means that good things happen and food is added rather than the dog coming to fear that you are possibly going to disturb or take away its food. Cases of separation anxiety are often addressed using the dog’s daily food allowance so that the dog is distracted for gradually increased lengths of time in the owner’s absence. This can have a marked effect on the dog’s perception of being left alone and away from its owner. A high quality, desirable moist food such as Forthglade is very conducive to stuffing into a hollow food device such as a Kong, whereby the dog has to work hard to get to that food when it is presented to the dog. The dog is then focussed on the task of getting to the food therefore far less focussed on being alone. Teaching a puppy these skills from the outset, so as to avoid separation anxiety is a sensible approach. To sharpen and reward the recall process. Well-timed rewards when a dog returns promptly to your recall command can make all the difference. Introducing a high-value food when out in there fields or park with your dog can make all the difference. Some owners are of that mid that the dog should just return when they call it and that’s it. This simply isn’t the case and all beings need the motivation to do something. A dog’s nose is a powerful thing and they can be distracted by all sorts such as other dog scents, other animal scent and the simple joy of playing with other dogs and being fussed by people. You’ll need to find a food that is healthy but is also top trumps over all of the above. Okay, I admit, food is not always the winning motivational factor for dogs, but thankfully, most of the time it works - especially when we spend a little time to find the dog’s Achilles heel food-wise. Food can also help distract a dog from something that frightens it such as other passing dogs, traffic, domestic machines in the home such as vacuums, hair dryers and so on. Placing the dog on a lead for basic control and then to make gradual introductions to the item it fears whilst marking calm behaviour with the food is often a simple way forward. It’s really useful to teach your dog to sit when greeted by people and not to jump up at them. This is important for dogs of all sizes, but especially so with larger breeds, as they may cause fear or harm. The best time to instil this approach is at puppyhood, particularly as people will inadvertently encourage bad habits by allowing cute and light puppies to jump up at them for affection and greetings. The desirable method when you meet another person is to place your dog into the sit position and for all four feet to be on the ground before it is given a food reward from the other person or alternatively fed by you as a result of its polite position. There are no secrets to toilet training and the supervision and timing of taking your dog outside are critical to success. Feeding your puppy a quality, natural food will help him produce timely and firm stools, making it easier to time his need to go to the garden and relieve himself. Poor quality food often causes diarrhoea and can make it difficult for the dog to control his bowels and for you to successfully time toilet breaks accordingly. A lot more information in puppies can be found here. Older dogs can also find it increasingly difficult to control their bowel functions and a high-quality senior food can help them toilet in the way that they have been used to. What do you feed your dogs and why? I'd be interested to know!